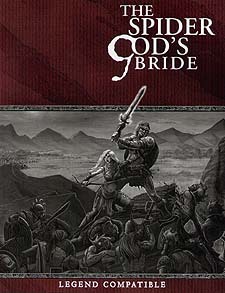 The Spider-God's Bride is a collection of ten blood-red sword and sorcery adventures, inspired by the pulp era tales of Robert E Howard and Clark Ashton Smith. Venture in the footsteps of Conan the Cimmerian, Satampra Zeiros of Uzuldaroum, Imaro of Nyumbani, and other fabled thieves, reavers and slayers! You will require the Legend Core Rulebook to run these Adventures.